Jungle Red Writers: Would you trade your sanity? 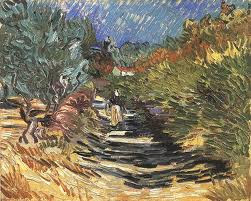 JAN BROGAN: After something like my sixth trip back to Provence, I realize that I've probably seen just about everywhere Vincent Van Gogh was treated for mental illness. This has less to do with a fascination for Van Gogh, or mental illness, and is more a testament to the fact that the French tourist industry has learned to market the crap out of pretty much everything to do with the impressionists. Nonetheless, the last mental health institution I found myself in -- in St. Remy - was worth every euro. (That's me with Vincent on the road to St. Remy left now and below, that's Vincent's painting of the road to St. Remy then) And the most fascinating part was that you could actually see the exact scenes Van Gogh was painting from the windows. Poor Vincent. Treatment for bipolar disorder was pretty lame. Warm baths. That was pretty much it. Six months after he was released, he committed suicide. Still, as I looked from the actual skyline he painted, to a copy of the painting itself, I couldn't help thinking of his genius, of the creative perspective that produced such a unique rendering. Could someone sane have seen the wheat field or the sunflowers or the starry night that way? And what would we have all lost without Vincent's bipolar disorder. I am boringly sane. I don't really even have minor mood swings. I could drink six cups of coffee and still not be manic (which I think is a big disadvantage for a writer.) I found myself wondering, would I trade my sanity to see the world from such a unique perspective. Might I sell my sanity to the devil to create such world-altering and enduring art? Okay, fine, thinking about this. Still no. I have asked, however, at dinner parties, whether you would give up your life if someone told you that you would first be able to see the first real creature or being from another planet. That, as a result, you would KNOW there was intelligent life on other planets. Most people, okay, everyone, says no. I'm still on the fence. JAN: Now see, life from other planets doesn't tempt me at all. 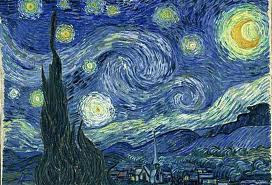 But creating Starry, Starry Night?And actually seeing the sky that way in one mind-blowing artistic moment.....hmmmm. LUCY BURDETTE: Now my other self, Roberta, is going to make sure I answer this with a resounding NO! Because as a clinical psychologist, I saw plenty of people suffering from mental illness. Nothing fun about it. Except maybe at the peak of a manic phase when you don't know how crazy you are--but the people around you are paying dearly for your condition. and you will too, once you're back to baseline. RHYS BOWEN: I have little interest in other planets, would never pay a million dollars to go to the moon. Give up my sanity to become a genius? Also no, much as I would like to write the great defining novel once in my lifetime. But I've been close enough to two people with bi-polar disorder to know that there are no circumstances that would make me accept this for myself. Selling my soul,on the other hand? Would any of you do that to become the most gifted writer/painter/tennis player? I guess I'll settle for being sane and ordinary. HALLIE EPHRON: Vincent Van Gogh. Alexander McQueen. Virginia Woolf. Ernest Hemingway. Moss Hart. Sylvia Plath. F. Scott Fitzgerald. David Foster Wallace. Some say Agatha Christie. As someone who comes from a family of "crazy creative geniuses," I can tell you that it's not fun to live with. Particularly for the kids. Manic is scary. Depressed is terrifying. Having lived through both, I'm with Rhys. I'll take sane and ordinary every day of the week. So I don't know if you have to go whole hog into manic-depressive or obsessive-compulsive disorders to be great. That kind of Van Gogh talent seems to strike like a comet fall, and whether you're mentally or physically ill or whole seems to have little to do with it. DEBORAH CROMBIE: I've never bought into the "genius requires insanity" thing. Most of the best writers I know are extremely disciplined, hard-working, and not the least bit dysfunctional. I did have a friend once who was brilliant but suffered from bi-polar disorder and later committed suicide. She could never have finished a novel, as talented as she was. But, like Julia, it often occurs to me that all writers are crazy on a MINOR level. Non-writers don't walk around with a completely imaginary cast of characters carrying on lives in their heads. (I don't think.) My family doesn't blink when I say, "Oh, Charlotte needs one of those." Or, "Duncan would cook that." But back to Jan's question. Would I trade my ordinariness for a moment of blinding genius, if insanity WAS required? Nope. I like my ordinary life just fine, thanks very much. ROSEMARY HARRIS: I mentioned this question to my husband and his response suggested that he thought I already HAD traded my sanity for my "art." But seriously...no, of course not. I like my life far too much and I don't think writing a bestseller or painting a masterpiece would change things for me that much. Now, if you threw in unlimited amounts of time and the ability to reverse the aging process then we might have a deal. JAN: If I'm not mistaken, Ro, you are talking about immortality, and I think those deals are brokered strictly by you know who in the infernal fire beneath us. I'll give him your card. But back to creative genius, while I don't think you have to be crazy to be genius, I think an awful lot of artistic geniuses had some serious mental disorders. 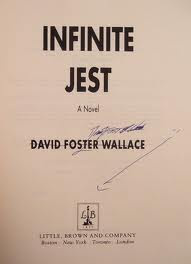 The first time I read David Foster Wallace, I said to my son, he has to suffer from mania, right? And my son asked how I knew and I said, you just can't write like that without being manic. There's a certain....well, brilliant mania to it that just doesn't come out of an evenly paced mind. Would any of us voluntarily make the exchange of inner peace for artistic genius, probably not. But is anyone else out there tempted? Tune in tomorrow for true crime tuesday, the irony and possibilities in the yoga shop murder. Jan, that's quite a travel plan there! What a good discussion, thought-provoking, to be sure. No, I would not trade my sanity or my life for much of anything. There's little enough sanity in the world as it is. Why add to the cray-cray? I'm with Hallie on the big NO. It's not pretty if you've ever lived with it, and I wonder how a bipolar person might answer. I used to think I was unique for always being "on the job" in a mental sense. Then I became friends with a nurse and a doctor, and got to know a cop or two, and they can't let go of the work baggage, either. And their stuff is a lot nastier! I've known a few people with bipolar disorder who do not want to medicate because they believe that their artistic talents are interwoven with their mania. I am not bipolar, but I believe that when I create, I tap into whatever my current mood is. I might not, for example, suffer depression like a bipolar person, but I believe that when I feel depressed (or whatever mental state I'm in), it is reflected in what I create. Aliens, however, do not tempt me. No takers on the aliens, huh? No desire for the ultimate insight into the universe? Now I see why my dinner party guests all looked at me like I was--oh. Maybe that's why you're a published author and I'm still struggling with my first novel? This tempts me to reply. "I wish I had some sanity to trade." Real insanity is not so nice, but creative insanity is very wonderful. It is always a little bit of a shock to meet people who don't let their imagination play. When I know the back story on art that was created by a destructive genius it just makes me sad to look at it, or read it. Another vote for staying boringly sane! I'm a writer who loves to write (not even tortured about it) and I agree that insanity is a tough price to pay, for everyone involved. Plus, I'm not sure I buy the crazy/drunken/angry/whatever artist myth. But, voting for sanity, I WOULD say that, wouldn't I? Sanity. I'm checking in by phone so please excuse! Not willing to give up my sanity! However, having depression certainly influences my short writing. My writing partner use visuals (pictures from blogs or other Internet sites) as prompts for short, timed writing practice. We each have our own writing style, but it wasn't until we started doing this that I noticed the sad, dark side of my writing. Jan, have you followed the Van Gogh trail in Arles? The city's put up 12-14 metal easels with reproductions on his paintings at the location where he painted them, with a short discussion of the scene or painting. You can follow little bronze plaques in the sidewalk showing a man carrying an easel and they lead all through the heart of town. Some places look quite different, but I could easily imagine him on the banks of the Rhone, or sadly, at the hospital, amid the gardens. OOh, Hank, have you read The Sparrow, by Mary Doria Russell? Go to space AND come back, although Einstein's theories do come into play, and well, maybe there was a little soul-selling going, too! Hello Jan. I stood very near the bronze of Vincent 15-20 times now, either entering the hospital courtyard or leaving. My first visit found me breaking down in deep sorrow for his suffering and my mothers. Both endured a lot in their lifetime. I am an impressionistic oil painter myself and have been quite obsessed by it as well. Many painters have that quality about them, us, otherwise nothing would get done. Many people sell their souls in their careers, relationships and addictions. Some of us are addicted to solving the dilemma of a blank canvas and the beauty before us. Any prolific painter truly understands Vincent's obsession. 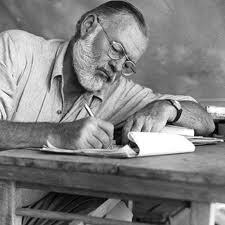 Mania, and depression enhanced his creativity whether others agree or not, it is true. I was once asked in a newspaper interview if I felt all artists were "mentally disturbed". I answered, "No, but it sure helps". I'll go back again in September to paint on the hospital grounds and in other villages. Thank you for your insight and recognition of a great man.